Your family relies on your home’s plumbing every single day, and if something goes wrong with your pipes, people may not be able to shower, wash dishes, or complete other normal tasks that require water. When that happens, it’s important to find an experienced plumber who can quickly find the problem, provide the necessary repairs, and ensure that your pipes are working properly. At Gladiator Repipe, we can handle any plumbing issue and replace any pipes that are leaking, broken, or simply outdated. If you live in Cambrian Park, contact us right away! If your home has old galvanized pipes that have mineral deposits built up inside of them, or they’re leaking at multiple points, it’s often a good idea to replace them entirely. 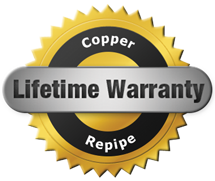 With our PEX and copper repiping services, you can have completely new plumbing in as little as one day. We’ll remove all the old pipes from your kitchen, bathroom, laundry room, and more, and add in new PEX or copper piping that will last for many, many years. Instead of inadequate hot water and low water pressure, you’ll have reliable plumbing that works when you need it to. When you can’t seem to get enough hot water, the problem may not lie in your pipes, but with your water heater. If that’s the case, we can repair or replace any broken parts, or replace the entire appliance with a new model. If your water heater is on its last legs, we can recommend the best replacement and provide professional installation. We also offer drain cleaning and sewer repair, so if you’re dealing with a tough clog or you don’t think your sewer system is flowing as it should, give us a call right away. We can clear clogged drains and investigate your sewer pipes to see what’s causing the problem, and once we know, we’ll repair or replace any sections that need to be.